Apple To Announce New iPhone On October 4th! Apple has just sent out invitations to it’s media event which will take place on the 4th of October. 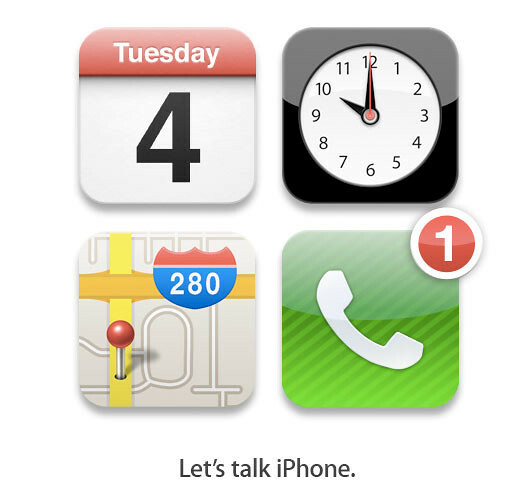 On the invitation, there are 4 iPhone apps with the tagline “Let’s talk iPhone”. The event will be held at their headquarter itself. Seems like the graphic that Apple sent out has a hidden message. Bottom right icon: Not sure about this but.. just ONE iPhone? Let us know what you think it is by leaving a comment below. One Response to "Apple To Announce New iPhone On October 4th!"